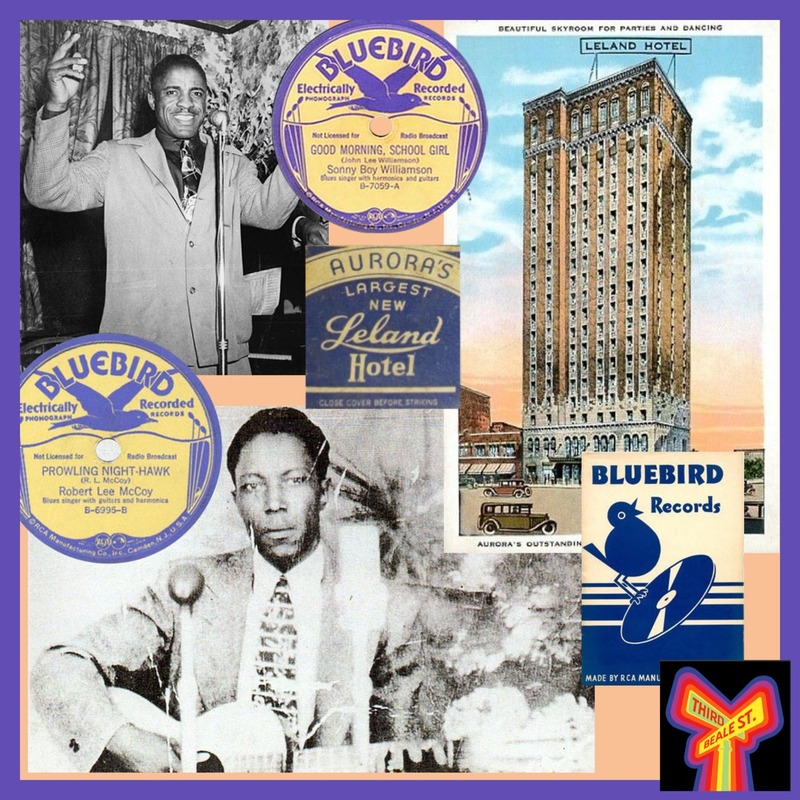 Over the course of two days, Tuesday May 4th and Wednesday May 5th, 1937, the Bluebird Record label arranged for extensive recording sessions with some of their current artists, as well as a few new faces, in the Leland Hotel at Aurora, Illinois (just to the west of Chicago). While some familiar names recorded the first day, Tuesday May 4th (Tampa Red, Washboard Sam, The State Street Swingers), a couple of new ones recorded as well -- Merline Johnson (also known as the "Yas Yas Girl") and Charley West, along with John D. Twitty -- the last two being fairly obscure figures who made just a handful of titles. For the sessions the following day, five bluesmen drove up from Saint Louis in a 1930 Model A Ford. Veteran musicians Walter Davis, Big Joe Williams, and Henry Townsend were among those coming back into the recording studio, and along with them came Robert Nighthawk (he was known as Robert Lee McCoy in the pre-war days) and John Lee "Sonny Boy" Williamson. The latter two were making their debuts as vocalists, courtesy of Walter Davis, who in addition to being a popular Bluebird recording artist, also worked part time as a talent scout. No one could've imagined, at the time, a more propitious recording debut. Teaming up in the studio with Big Joe Williams, the music that Robert Nighthawk and Sonny Boy Williamson made together was not only a harbinger of the small combo trio format that would gain popularity in the early days of post-war Chicago Blues, Nighthawk would go on to influence virtually every slide guitar player that ever worked in the Windy City. As for Sonny Boy Williamson, his musical legacy is something that Blues musicians still draw upon to this very day, not only in terms of his influential harmonica playing, but his incredibly rich catalog of songs. It's almost impossible to think of a Blues artist who hasn't, at some point in their career, performed or recorded a cover version of one of his songs. As for the title of this program, we've "borrowed" the phrase from the famous photograph, "A Great Day in Harlem." Certainly, Wednesday May 5th, 1937, was a great day in Aurora, Illinois, as two important and influential Blues musicians got their start, changing the course of Blues history as we know it.